When you go rafting with Timberline Tours on the Upper Colorado River, you’ll pass through the community of State Bridge, Colorado, a place that has an adventurous past and lives on as a marker for those who love the river lifestyle. Perched on the banks of the Colorado River, State Bridge has a small convenience store where visitors can stop in for coffee, snacks, and drinks before setting out on the river. Lodging that includes cabins and yurts is also available at State Bridge for overnight rental. Located along the Colorado River Headwaters Scenic Byway, State Bridge can be seen on the way to the Rancho Del Rio, where Timberline’s Upper Colorado River trips begin. After getting outfitted with essential rafting gear at Rancho, you’ll travel down the river through splashy rapids until you arrive four miles later at State Bridge, the trip’s take-out location. Colorado is full of unique river settlements and communities such as State Bridge that make every moment on the river feel like an exploration. Read on to find out more about the rafting, stand up paddle boarding, and duckie (inflatable kayak) trips that will take you through State Bridge, Colorado, a place that’s connected with Colorado’s colorful river culture. Due to its location on the Colorado River, State Bridge has long been a destination for summer river-goers. Timberline’s rafting, stand up paddle board, and duckie trips all end at State Bridge in an area that’s known for its natural beauty. While traveling down the four miles of river between Rancho Del Rio and State Bridge, you’ll have the chance to see Colorado wildlife that can include anything from deer and elk to bears, bald eagles, and otters. 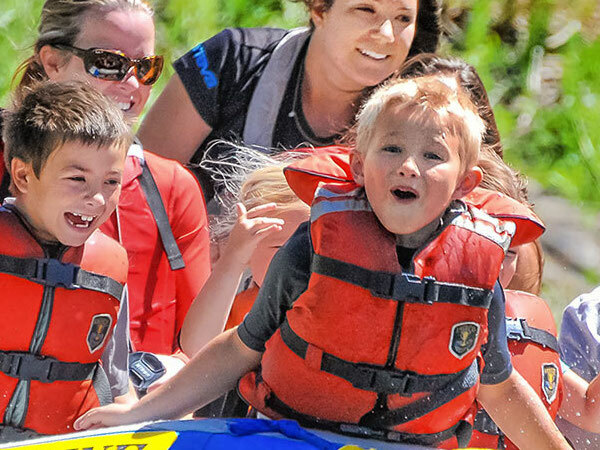 Rafting on the Upper Colorado River is a popular choice for families and for adventurers of all ages. Since this stretch of river that runs from Rancho Del Rio to State Bridge is rated Class II, its low-intensity sections of whitewater are fun and enjoyable. Guides paddle oar boats through smooth stretches of water, and guests can sit back and enjoy the incredibly scenic float down the river to the take-out location at State Bridge. Stand up paddle boarding trips near Vail are also popular on the Colorado River section that runs from Rancho Del Rio to State Bridge. Timberline’s guided stand up paddle boarding (SUP) trips in this area test the balance and skill of those who are ready for the challenge of moving water. SUP river trips are recommended for paddlers who have previous SUP river experience or for athletic paddlers who have a bold sense of adventure. But Timberline also offers SUP lake trips for beginners and for those who want to try out this sport on flat water before taking on the river. Duckie trips on the Upper Colorado River let paddlers be in charge of their own watercraft or pair up with one other person. 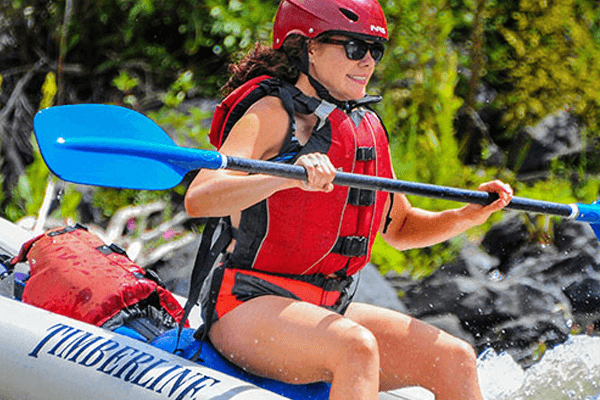 A duckie is an inflatable kayak, and those with no previous river experience will be able to learn quickly from guides how to maneuver in moving water. Duckie trips are a good choice for birthday parties, family reunions, group events, or corporate getaways since they’re fun for a wide range of ages and ability levels. Timberline’s duckie trips also follow the four-mile stretch of Colorado River that runs from Rancho Del Rio to State Bridge. At one time, the only way to cross the Colorado River in the area of State Bridge was by ferry, and many people ferried across the river along the popular route to Steamboat Springs, Colorado. In 1890, the State of Colorado authorized the construction of a wagon bridge across the river in the area of what is now called State Bridge to help ease the passage of travelers across the river, giving the place its current name. In the 1900s, hunters began coming into the State Bridge area more frequently due to its abundant fish, elk, and other game. In 1901, then Vice-President Teddy Roosevelt stayed at State Bridge Lodge while en route to hunting in the nearby Flattop Mountains. In recent years, State Bridge has been a popular music venue and hangout for people who love being close to the Colorado River. Many cabin and yurt lodgings are available for overnight or extended rental at State Bridge, allowing guests to stay longer in close proximity to this place known for its wild beauty and river adventure. Some of these history details were gathered from the State Bridge website’s history page, which includes more fascinating information about State Bridge in the Prohibition Era, State Bridge railroad history, and more: www.statebridge.com/history/. But if you want to see it yourself, join Timberline Tours and catch a glimpse of life at State Bridge on the way to Upper Colorado River rafting, stand up paddle boarding, and duckie trips this summer.